Launched just last week, NY startup Ollie makes nutritious dog food using human-grade ingredients, offering customization based on the unique needs of your pet. And they've come out of the gates with some serious pennies in their paws. Last week, we took a look at a service that provides dog houses on demand, so you can spend more time with your pet, and keep them a bit safer, while you’re running errands around town. Now there’s one more way to pamper your canine companion, and it’s being made possible by a newcomer to the New York startup scene: Ollie. The service makes nutritious kibble using human-grade ingredients, and even offers customization based on the unique needs of your pet. Just this month, the company raised $4.4 million to help you raise a healthier hound. The dog food Ollie produces is made out of the company’s Pennsylvania kitchens. All ingredients used are of the highest quality; the chicken is vegetable-fed and the beef corn-fed, so you don’t need to worry about your pet consuming meat pumped full of hormones. Pet owners expect nothing but the healthiest for their pets, and Ollie’s compliance with USDA and Association of American Feed Control Officials guidelines should meet their high standards. According to the company, Ollie’s recipes have been designed by a veterinary nutritionist to make sure that the meals cover everything dogs require in just the right amounts. There are currently two recipes from which to choose: one chicken, and the other beef. 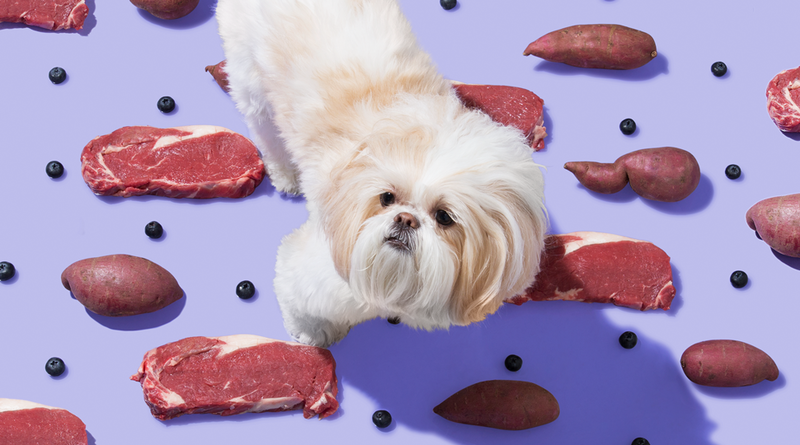 Both seem to be chock full of nutrients, which the startup claims contributes to helping dogs live longer with fewer diseases. Then, there’s the real secret sauce. The Ollie website puts users through an onboarding process during which stats about their pets such as age, breed, weight, usual activity levels, body type, and allergies are collected. It covers all the information that you should factor in while considering the kinds of meals your dog needs. Ollie runs the information through a proprietary algorithm that determines how many calories and what types of nutrients would best serve your dog’s dietary requirements. If you can swing the money for the meals, the dog food will be shipped out to you every two weeks. The service works on a subscription model, and the exact amount you’ll end up spending depends on the size of your dog. Ollie estimates that its meals will cost around $3 a day for small dogs. That’s a bit on the pricier side, considering that dog owners currently spend about $390 a year (including treats and vitamin supplements) on food, which comes out to a little more than a dollar a day. But if the uber-healthy dog food ensures a more full life for your pet pal, the added amount may be a small price to pay. According to the American Pet Products Association, $60.28 billion was spent on pet products in 2016. Of that, food accounted for $23.05 billion. Startups have been quick to see the potential for profits, with players like TurboPup, The Honest Kitchen, and PetPlate in the fray. Having just launched, Ollie is the newest member of that group, but has already built a strong foundation. Unlike some competitors, the service is available across all 48 contiguous states. They now also have a decent stack of cash in their paws from a pretty substantial venture round. Turns out there may be enough here to make more than a few people drool. I would agree that people are spending that amount each year. That is a fair statement and really all you are trying to do is keep your pet healthy so they live forever, right? The issue is, in the wild, what would they eat? A chicken? Berries or nuts and things like that? I worry about companies like these. First you start out small and probably local, but as you grow, where do you think the chicken is coming from? Slowly you are trying to make more money by cutting costs and all of a sudden you are in IPO phase and that means more cost cutting. Stay small, might be a great idea. A few years ago I started looking up ways to make my own food for my dogs. I just cannot trust store bought food after all of the recalls. I might give this a try if it is truly a custom option. I love this idea! I have been making my own dog food for my puppy based on what I would like him to consume. This would be taking a little away from me, but getting him the same, quality food that I can keep an eye on.